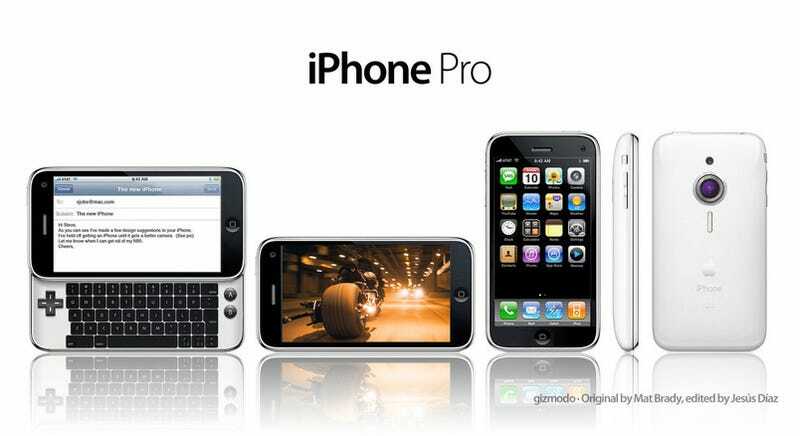 Here's the new iPhone Pro, something that we don't expect at MacWorld 2009 at all. However, we do expect something like this to come at a later date. Why? Because it just makes sense. This concept started as a Photoshop idea by Giz reader Mat Brady. He wants to get rid of his Nokia N95 but can't get himself to buy an iPhone for the same reason other people don't like the current iPhone. Lack of a physical keyboard, lack of a good camera, and not enough storage. I've an iPhone 3G. I love it. In fact, now that I'm in Spain and I can't use the 3G-because AT&T will nail me for the data roaming at a buck per megabyte-I miss a lot of things, from Maps to Facebook. But even while I can't live without it, I can see those shortcomings. In fact, I've bitched about the camera and the storage quite a few times. Mat made his concept and called it iPhone Elite: an iPhone with 60GB of storage, true 16:9 aspect ratio, slide-out keyboard, one megapixel front camera for iChat, and a high quality camera, with good lenses, optical zoom, and video capability. That's good, but we thought it could be a bit better. We fixed the keyboard to make it more rational and compact, losing some unneeded keys. With the space, we added what it's really needed to make the iPhone a true Nintendo DS competitor: A direction pad and two buttons. For the D-Pad, we didn't want to reinvent the wheel and just copied Nintendo's tried-and-proved design. Is this doable now? Technologically, it is. We've seen designs by HTC that get close to this, although they don't have the software and the final polish that this class of Apple product may have. Would it be more expensive too produce than the current iPhone 3G? Of course. Would we want to pay extra for it? Definitely yes.